The Princess and The Pump: A Type 1 Diabetes Blog: I Found the Cure! Today's Wego Health prompt is to write about a proposed cure and what you think about it. I FOUND THE CURE! Woo Hoo! No more Type 1 Diabetes! And guess what?!? It's SOOOO simple! We just got an email about it! All you need to do is send a picture of yourself or your CWD to this natural healer. Add a short description of the diabetes. He will make a recommendation. Probably that you buy his herbs. Herbs will do the trick. It will clear that diabetes right up! OR you might need a healing touch. The best part? There is no charge for sending in your picture. You will need to pay for the herbs that are prescribed. And pay to go get your healing touch if that is required. OR... What about Cinnamon? I hear that is the cure for diabetes, too! Or diet changes. That will do the trick. Or what about that moss that grows on trees?!? I know that most people who suggest these "cures" are just trying to help. I also know that they know NOTHING about Type 1 diabetes. And although I know that their hearts are in the right place, I can't help but get.... really MAD. We were sent an email about a natural healer. It included the line, "I can't imagine living like you do". And to me, that's a slap in the face. My child has been living with Type 1 diabetes for almost 2 years. Yes, we have had to hold her down for each and every shot six times a day for six months. Yes, we still have to fight her for site changes. Yes, there are tears. Mine AND hers. Yes, it hurts. More than those on the outside can imagine. Yes, we worry. A lot. Yes, we get up every night to check on her. Yes, we function on very little sleep. Yes, I worry about her future. Yes, I worry about sending her to school. Yes, I wonder if she will ever be able to live alone - without fear. 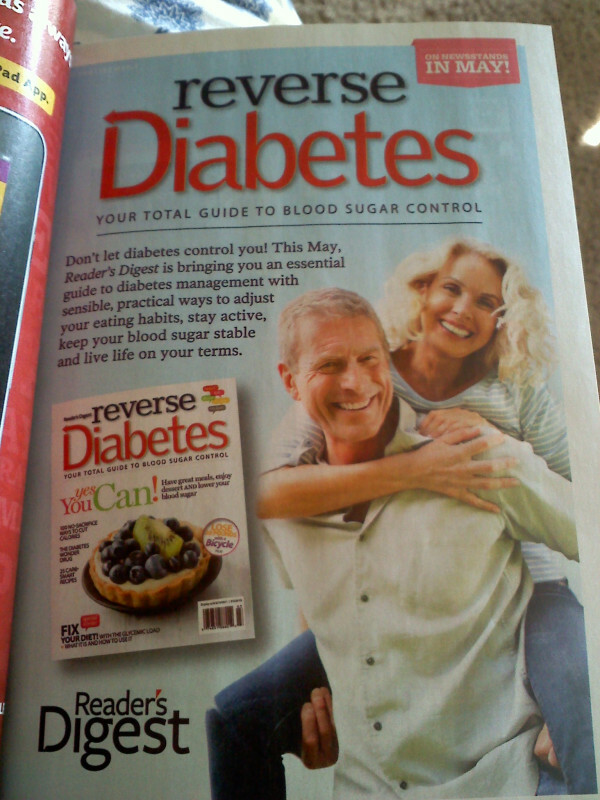 Yes, I wonder if diabetes will cut her life short. Yes, I am afraid of complications. Yes, I am afraid she won't wake up. Yes, sending her to school makes me break out in a cold sweat. Yes, I would do ANYTHING to remove this disease from her life. I'd feed her cinnamon by the truckload. I'd totally change her diet. I'd give her herbs. I'd crawl across broken glass on my hands and knees. I'd walk across hot coals. I'd take in on MYSELF if I could. I'd travel to some far away country and climb the highest mountain to get that tree moss. So do you really think that if there was a CURE for this disease that I'd still be "living like this"? If it was REALLY that EASY - don't you think I would have done it? And SERIOUSLY?!? Cinnamon or the touch of a stranger is going make her pancreas stop killing itself? BOOM - just like that?!? Well, Dang! I guess all that testing and injecting and crying and worrying was for nothing. WHY didn't I think of that SOONER?!? I got this little bit of lovely from Kim of Texting My Pancreas. This will be the feature of the Reader's Digest in May. Nice, huh? If you would like to write to the Digest and express your opinion of this - go right ahead! You can reach them at letters@readersdigest.com! Apparently, keeping your blood sugar "stable" (don't I just LOVE that word!) is as easy as adjusting your eating habits and staying active. THEN... You will be able to "live life on your own terms". "I can't imagine living like you do." No.... You CAN'T imagine it. And I hope you never do. I wouldn't wish it on my worst enemy. This is OUR life. And I think we do a DANG good job of LIVING it. In spite of the numerous finger pricks. In spite of the injections. In spite of the site changes. In spite of the blood. In spite of the mountains of supplies. In spite of all the required planning. In spite of all the carb counting. In spite of the hurt. In spite of the fear. In spite of the worry. We have HOPE. And we have LOVE. And we have EACH OTHER. In spite of all the ignorance. In spite of all the false hope. In spite of those who feel sorry for us. In spite of those who think we caused this ourselves. In spite of those who think a cure is as simple as an herb. The only thing we NEED... is the CURE. I love how your post always show that you're not waiting for a cure on bated breath - you're still living life fully and enjoying it all. I think that is what living life with hope is about, the opposite of despair, right? Very well put! As a T1 diabetes survivor of 42 years please have faith that your girl will grow up to lead a full and happy life even with this stupid disease. I know my parents worried as you do now but I am happy, healthy with a great family and buiness and wouldn't have it any other way. Except....maybe...a REAL cure! Thanks for spreading the word about these so called cures! Someone said to me yesterday...I couldn't do it. I said, Yes you could. I wanted to rant on and on...but we make the most of life. THE MOST! This is amazing and true down to the very last word. Thankyou for posting this. My mother in law still to this day 2 years after dx tells me that yoga, yes yoga can help "control" liv's bloodsugar! Hummm if that was the case don't you think all us parents would be flooding the local gyms with out kids signing up for every single yoga class offered! I get so angry too, more angry when it's a child. I was child once, back in the 80s. I'm thankful for advancements but Diabetes is about management and management only. No preventing (yet, for T2), no reversing, no curing. Just management. I'm SO disappointed in Reader's Digest. What a Horrible headline. Why does the media Insist on using That word? Ugh. LOVE your passion. and YOU! My other favorite comment that I have heard on more than one occassion is "How do you do it?"... I just say, we don't have a choice, we HAVE to do it. And you would too because the alternative is not an option. Awesome and very well said!! As parent of a child with diabetes for 7 yrs now, sister of someone diagnosed 20 yrs ago when she was 13, and niece of two uncles with type 1.... you are RIGHT ON with your comments, your blog, your anger! thanks for a very good blog.. and thumbs DOWN to Readers Digest! OK, the "yoga comment" above has me cracking me up. I too hate seeing these articles...it contributes to the misinformation...the media is a powerful force and for each baby step forward that we make...they send us back two or three BIG STEPS. I loved this post. It is what I want to shout at anyone that says stupid stuff to me about T1D. A friend of a friend is seeing her son through his second round of chemo and she has a brand new baby too. I'd never ask her how she does it becasue I know the answer: she has to. Just like we do. And it's HOW we choose to do it that is the important factor. You took the words right out of my mouth. Thank you! hmmm... I have not tried the yoga yet. JUST THINK, what if we did Yoga in a pool of cinnamon?? I think the downward dog is our best chance so that we can also lick the cinnamon. YEP! That's it... I think we found the trick. ...i think Reader's Digest, like most people confuse the differences between t-1 and t-2. ..this is my biggest frustration --people just don't understand the difference. ignorance surely is bliss i guess. There is so much confusion about T1D versus Type 2. I really wish it could be renamed to something that sounds as scary as it really is - then maybe people will stop thinking that it can be "fixed" with herbs and exercise! When my husband was diagnosed 27 years ago, we were told he had "IDDM" or insulin-dependent diabetes mellitus. When my daughter was diagnosed 10 years ago, they said it was juvenile diabetes. When my granddaughter was diagnosed 3 years ago, they said Type 1 diabetes. I think there has been progress in educating people, but we still have a long way to go. Your blog is helping with that education - keep up the great work! You nailed it, Hallie...thank you! I may have to steal that "in spite" ending and make it my walk donation letter this fall!!! My mom still says, "She's cured!" every time Mary Claire has a couple low blood sugars in a row. Oh, if it were that *spontaneously* easy. You are awesome, as is this wonderfully-written post. you rock, hallie! fantastic post! OMG totally cracking up at Lora's comment...people are stupid. The media doesn't use FACT CHECKERS!!!!!!!!! GAWD. Many of these articles are just stupid, but Americans are not very scientifically literate so I guess it's no surprise they buy into stuff like that. I have even seen endocrinologists who do not seem to know the difference between Type 1 and Type 2 diabetes! Incredible. I also get very angry when people make comments or suggestions and they don't know anything about it. I loved this article and your post. Thank you for this great blog.